“And the heart is hard to translate It has a language of it’s own” (All this and Heaven – Florence and the Machine) Expressing “the heart” has long been a fascination with artists, poets, psychologists and philosophers to mention just a few. It seems to be a compulsion, a basic human instinct and an idea that has helped to shape the concept that using art as, and in, therapy might help heal the “heart”. But forget ink-blot tests, (and other early “projective” psychological tests) in the contemporary world, art and therapy have forged a new relationship and are proving to be a very effective way to treat people with psychological problems. This essay will explore the development of art therapy and how it works. The second part of this essay will explore the concept of Art Therapy and spirituality; how exploring a client’s spirituality alongside Art Therapy might be an effective process for some clients. Perhaps the best place to start is to consider psychological definitions of what “the heart” of a person might be. The heart in the context of this song is perhaps defined as the “the centre of a person’s thoughts and emotions” (Oxford online dictionary). So when the song talks about the heart, it is really talking about the deepest parts of the human mind. The words “conscious” and “unconscious” are so familiar today, it can be difficult to imagine how we conceptualised the human mind without them. They are key concepts in the development of psychoanalysis and Art Therapy. Sigmund Freud was perhaps one of the most influential psychologists of the twentieth century, renowned for his paradigm for the human psyche: the ego, the super ego and the id. It was he who drew attention to unconscious processes and how they may affect human behaviour. Often depicted as an “iceberg” illustration, with different levels of consciousness above and below the “water line”, Freud’s theories are as follows: consciousness is the part of the iceberg showing above the water – and is the interaction a person has with reality. The unconscious is the part of the iceberg below the water. The unconscious is the part of the mind that a person is not necessarily aware and is perhaps synonymous with “the heart”. Freud hypothesized that conflicts between the different levels of the human mind may be the prime cause of psychological distress. It is this that forms the basis of psychotherapy, of which Art Therapy is a version. (Psychology – A Very Short Introduction p.6) So psychotherapy, to use Freud’s terms, is a treatment to help resolve these conflicts and relieve the client of psychological distress. Carl Jung’s position was similar, believing that the sources of a clients negative behaviour could be found in the unconscious. Perhaps the most famous, and one of the earliest forms of psychotherapy is known as the “talking cure”. Coined by the client of Dr. Joseph Breuer in the 1880s, Anna O,the phrase is self-explanatory; a client “talks” their way to healing and are relieved from their psychological distress. (Freud S,The Origin and Development of Psychoanalysis – Lecture 1). But how does this “talking cure” work? In understanding this, we can understand more about psychoanalysis in general, and ultimately, how Art Therapy works. It was Ferdinand de Saussure, a swiss linguist writing at about the same time as Freud, who came up with the idea of sign systems to understand how language works. A “sign” is made up of two parts: the sound or mark (the word said aloud, or written on paper) which is known as the “signifier”, and the concept that this generates in the human mind called the “signified” (Selden R, Practising Literary Theory and Reading Literature p75). So when a client takes part in the “talking cure”, they are beginning with the concept (or the “signified”), which will be a thought or feeling that is unexpressed, left silent in the unconscious. Words or “signifiers” are assigned to these thoughts or feelings. It seems this is what the human mind wants to do. According to Jacques Lacan who, whilst looking at the experiment involving Anna O, observed: “The more Anna provided signifiers, the more she chattered on, the better it went.” (Lacan, Jaques, The Four Fundamental Concepts of Psychoanalysis p. 157) It seems that the unconscious is particularly keen to express itself, hence the phenomena of “Freudian slips”. As Stephen Pinker puts it: “Our thoughts come out of our mouths so effortlessly that they often embarrass us, having eluded our mental sensors”. (The language Instinct p. 8). Perhaps it is worth looking briefly at the function of language in day to day life – our “reality”. Language is a way of communicating with others in our reality. Often individuals who have problems connecting with reality, have problems communicating with those around them and issues with relationships. It can perhaps be said that providing words for the unconscious thoughts and feelings is a way of bringing concepts into the conscious mind (the part connected with reality), because it is the method of communicating with reality. And it seems that it is this process that brings relief to the client, partly because it is an instinct; our minds are pre-programmed to use language to communicate with our reality as explained by Chomsky (Pinker, S, The Language Instinct p.10), and partly because it provides meaning and coherence to undefined concepts. As Saussure explains, “once the signified has been joined with the signifier, they form a natural bond. We feel and behave as though the words are inseparable from the concepts we have of things.” (Selden R, Practising Literary Theory and Reading Literature p.76) So what has this got to do with Art therapy? Well, Freud and Pinker (amongst others) observed that language may not be the most efficient way to find and express the concepts we have in our unconscious minds. As the song above says, the heart “has a language of it’s own.” Stephen Pinker calls this language “mentalese”. He describes this as a “silent medium of the brain” (The language Instinct p.48) and perhaps the idea that this medium of the brain is silent, gives us a clue as to why using Art in Therapy can be a more effective therapy than the “talking-cure” alone. According to contemporary psychological studies, vision is our best developed sense, with about half the cortex being related to vision (Psychology – a Very Short Introduction p 16). This theory, along with Margaret Naumberg’s acknowledgement that “a persons fundamental thoughts and feelings are derived from the unconscious and often reach expression in images rather than words.” (Arrington, D, Thinking Systems – Seeing Systems p.202) gives further evidence that using Art, as a visual medium, rather than the acoustic medium of talking, to express the unconscious is more instinctive and efficient. Even Saussure, whilst being a linguist, did not limit his theories of sign systems to language alone. Non-linguistic symbols and visual images are also “signifiers” and therefore can be applied to unconscious concepts to generate the same feeling of coherence. At about the same time as Freud was writing, artists such as Clyfford Still, Jackson Pollock, Mark Rothko and Wassily Kandinsky were exploring ideas around art and expression. Called “Abstract Expressionists”, these artists were using spontaneous and unrestrained methods of creating art, their art was intended to communicate feelings and evoke an emotional response from the viewer (Malchiodi, The Art Therapy Source Book p. 31) So the connection between art and the unconscious was being established and at the same time, art as a therapeutic medium for psychiatric patients was also being explored. At first it was believed that artwork produced by mental health patients could be used as a diagnostic tool. Ambrose Tardieu published a book in 1872 giving characteristics of artwork produced by mentally ill patients. However, it has since been established that this perspective of such artwork is unrealiable. Since this conclusion became apparent, two different, but overlapping, ways that art is used in the therapeutic process have emerged. The first is known as “Art as Therapy”. This is using Art as a therapeutic process in itself. Of course it is commonly understood that creating art is satisfying for some people, it is simply an enjoyable activity which boosts self-esteem and gives the imagination a chance to experiment with new ideas. 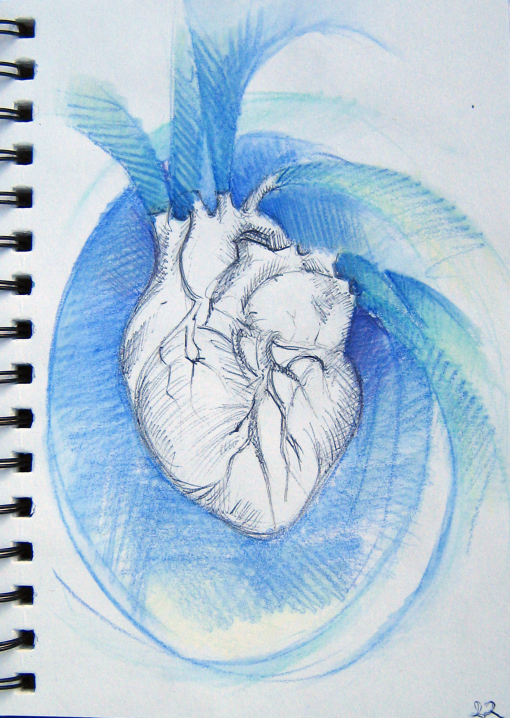 There are more scientific reasons why the process itself can be of benefit, as Cathy Malchiodi summarises: “Drawing and art expression provide “self-soothing” experiences, ones that are used by traumatized children to reduce stress and ameliorate posttraumatic stress reactions and the rhythmic actions involved in drawing and coloring are reminiscent of the movements used in trauma interventions such as Eye Movement Desensitization and Reprocessing (EMDR)” (Malchiodi, C, Using Drawing as Intervention with Traumatized Children. p5) So simply creating art, whether drawing, painting or other creative medium, brings relief to the client. Art in the therapeutic process is also carried out as “Art in Therapy”. That is, it forms part of a therapeutic process that aims to treat the client by identifying specific issues in their unconscious and bringing them to the consciousness in order to facilitate healing. So a client creates some artwork, perhaps a drawing or painting, and then talks about the artwork with the therapist. There are flaws associated with using art in therapy. Artwork, being a more universal form of expression is more open to projection from the therapist, and they need to be careful not to do this. As Cynthia Freeland puts it: “ When viewers follow the artists efforts, we recreate the process of self-discovery, so we too become artists.” (Art Theory – A Very Short Introduction p.108) This is because the images created are new, and ambiguous. This ambiguity is intrinsic to art because it is not constrained by the grammar and structure of language, which only have words for familiar notions (Art Theory – A Very Short Introduction p.108). The images don’t have meaning because the “signifiers” have not yet formed a bond with a concept and the therapist has to be careful that the signifiers are assigned in a way to affect a healing process in the client, not in a way that the therapist finds satisfying. So we see that it is a combination of the two mediums that proves to be so effective. The process of making art allows metaphorical symbols to emerge from the unconscious, to be represented effectively, then brought into the conscious mind through discussion in linguistic form as the therapist encourages a connection with real life events. So when the singer of the song at the beginning of this article exclaims: “And the words are all escaping me And coming back all damaged And I would put them back in poetry If I only knew how…..” (All this and Heaven – Florence and the Machine) …..an Art Therapist would perhaps suggest putting down her writing pen, and picking up a paintbrush instead.